See a 12 part video of a Zen amp being made! 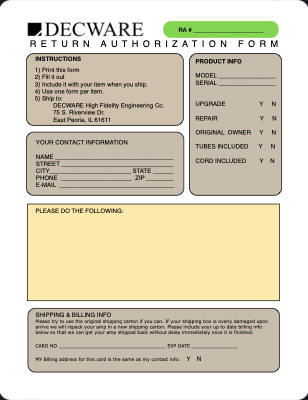 We ask that you download and print the form shown here and include it with any repairs, upgrades or warranty transfers. If the original purchaser of the amplifier sends it to Decware instead of sending it to the buyer, Decware can check it out, transfer the warranty, and professionally ship it on to the buyer. This guarantees the buyer that the amp is certified and in perfect working condition and will not be damaged in transit (because we're expert packers). Cost of warranty transfer is $100 or 10% of the models current price, whichever is more. This does not include tubes. All warranty transfer's will require a complete set of factory tubes that have been tested in the actual amplifier prior to shipping it to the buyer. If you are the seller, it is important to understand that we are going to supply the buyer with new tubes that have been tested in the unit as part of the warranty transfer. Therefor should you wish to sell the buyer additional tubes, perhaps the used tubes that were in the amp when you sold it, etc., we request that you ship them directly to the buyer. As you know, shipping tubes vibrates them aggressively and can cause damage, noise, or reduced life. We do not want to be a contributing factor or involved in any way with handling of used tubes. Our current tube prices can be found here. If you have acquired a Decware amplifier somewhere on the used market you can send it to us for re-certification where we will make any necessary repairs and charge you for them. At that point, if you wish to purchase a warranty for it, the same costs apply (as described above). You will also be required at that point to purchase a new factory tube compliment that we test in your now certified and warrantied Decware amp. If your amplifier requires service, the first step is to e-mail or call us to describe the problem. We can walk you through some simple troubleshooting steps to be sure the problem isn't something simple like a tube, cable, or connecting component. If we can not solve the issue by phone or e-mail, we will request that you send the amplifier in for service where we will test it and make any necessary repairs. Turn around time on repairs is typically 1 week not including shipping. Despite being familiar with the issues via phone or e-mail, you MUST include the RA form at the top of this page with a brief description of the problem. All Decware amplifiers come with a 30 day trial with a 10% restocking fee. IF you should have a technical issue during this trial period and have to send the amplifier back to us for repair, we will make the repair (usually the same day it comes in) and reset your 30 day trial to restart once you have received the working amplifier. DEPOSITS: We will charge a 10% NON-REFUNDABLE deposit on all orders at the time of sale. Balance due will be billed when the order ships. RETURNS: We will accept returns on tangible items 30 days from date of delivery less a 10% restock fee and any damages to the item. CANCELED ORDERS: Life happens... if you have to cancel your order no further billing will take place. CUSTOM ORDERS: If you have configured your order with custom options, the added cost of those options may be billed at the time of order and are non-refundable. Custom options also VOID the 30 day trial but DO carry the lifetime warranty. You will be notified when your order is ready to ship and updated with a tracking number. Upon receipt of your order you will have a 30 day trial period to make sure you love it. DIGITAL ORDERS: You will receive an e-mail shortly with links to your downloads. PAYPAL: Paypal orders are usually charged in full at the time of purchase. If choosing to pay by check or money order, payment must be received within 10 business days or your order will be canceled. Decware warranties most of out tube products for the lifetime of the original owner/purchaser. This warranty covers defects in materials or workmanship. It does not include tubes, which carry their own 90 day warranty. What the warranty does not cover, are damages from shipping, abuse, miss use. Modifications or repairs made by anyone other than Decware will void the warranty.